While I typically turn my nose in snobbery, I'm dedicating this edition of Friday Night Slice to a few of the express chain pizza options - those second tier pizza delivery conglomerates that attempt to marry the quality and variety of the smaller shops with the prices and portability of Pizza Hut, Domino's and Papa John's. I've often heard that one of the most appealing aspects of large-scale chain restaurants (in any genre - McDonald's, Olive Garden, Starbucks, etc.) is the concept of reliable consistency. There is something comfortable to a consumer about the fact that anywhere in the world, a Big Mac tastes like a Big Mac and a slice of Papa John's pizza tastes like rubber. It makes them feel a sense of control, perhaps, in this mysteriously chaotic and uncertain world? Anyway, with these less-than-global chains that I've chosen for this week's discussion, that uniformity is missing - which is probably a good thing. I have had different experiences at different locations and even with the same location on different days. So here are my general thoughts. What are yours? Snappy Tomato popped up in our area not long after we did (along with their ridiculous snapping tomato logo and some poor soul dressed in a life-sized version of it, standing outside in the hideous August heat). Started in Kentucky over 25 years ago, the franchise now has locations in Ohio, Indiana, Missouri, Florida and Alabama with four locations here in Middle Tennessee. 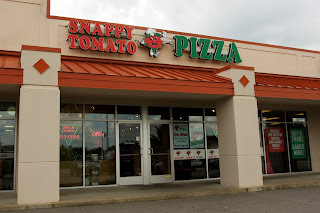 Snappy Tomato has a variety of carefully crafted (and heavily branded) pizzas from the Snappy Veggie™ to the Snappy Hawaiian™ and a few pizzas that start with alternate sauce bases such as the Buffalo Grilled Chicken Pizza™ and the BBQ Chicken Pizza™ that start with hot wing and BBQ sauce respectively, and the Snappy Ranch Pizza™ (guess what it starts with). Outside of their rectangular deep dish pizza The Beast® (not to be confused with the real The Beast), the standard pizzas are round, triangle-cut hand-tossed pizzas. The basic red sauce is unique with a big dose of sweetness in the tomatoey base. The medium-thin crust is rather sweet as well, pushed out to a thicker edge with a light, puffy roll. The cheese and other toppings are totally ho-hum, dabbling into CiCi's territory with some of the dessert pizzas (here you go, it's a can of chocolate pudding and peanut butter chips melted on top of a pizza crust). Pricewise, you'd think they'd have a better logo based on how much they charge for their pizzas. They line up alongside the local spots with their cost, but more closely find themselves matching up with the big chains in terms of taste. The only reasonable value is found in the buffet, and you'll need to come hungry to get your money's worth. The restaurant on our side of town (the Nipper's Corner location) has been clean and staffed with friendly folks when I've stopped in, and despite the fears that usually rise inside of me when I hear the word buffet, theirs has been kept neat and freshly stocked on my visits. I think of Snappy Tomato as fast food that's better than most fast food, but fast food really isn't about the food. 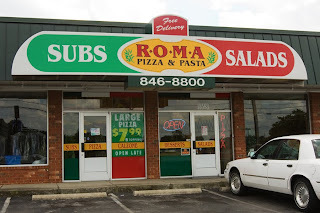 The locally owned Roma Pizza and Pasta has 19 locations across Middle Tennessee from Bellevue to Bordeaux, Dickson to Donelson and Madison to Murfreesboro. Started in 1999 by a business entrepreneur and an "old country" Italian baker, Roma offers homemade pizzas, calzones, pastas, wings, strombolis and salads - all prepared fresh daily using the freshest herbs, spices, oils, cheeses and other toppings. They prepare pizzas with both the standard toppings and more "gourmet" / offbeat options including a Philly Cheesesteak pizza and a Mexican Feast jalapeno and ground beef pizza. Their delivery prices are set up to seriously compete with the chains and they offer incredibly low take-out specials as well. Roma's pizza is pretty middle-of-the-road in terms of flavor using a basic tomato-based sauce, a standard mozzarella cheese and the typical pepperoni rounds with minimal spice. I usually find that the sauce is applied somewhat thinly (not necessarily a bad thing) and the cheese pull-away factor is medium to medium-high. The crust is a medium thickness hand-tossed base with a good doughy flavor, but it has the tendency to harden quickly as you're eating. Roma tends to get mixed reviews from everyone though, myself included. There was a time when I thought that it was pretty darn good and (especially since they delivered and were close) it was a great, cheap and easy Friday night option. Apparently, the quality varies from location to location with certain spots (i.e. the Donelson location) getting the dreaded low health ratings. For any restaurant, you can always check this out yourself, you know. Of course, it's still better than Domino's. 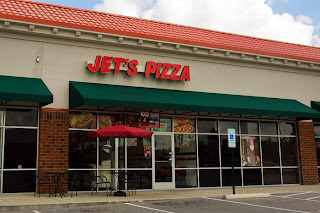 Jet's Pizza began as a small, single-location pizzeria in Michigan in the 1970s. Now located in 11 states, Jet's has 10 franchises in the Middle Tennessee area alone. Having never tried Jet's pizza, I was excited when they opened up a location nearby us in The Nip earlier this summer. While known for their variety of crust flavors (poppy seed, butter, parmesan, garlic and more) and their variety of shapes and folds that create all kinds of crust quantity options, what sets Jet's apart is the incredible Eight Corner Pizza. The rectangular, deep dish pizza measures over an inch in height, cut into eight equal slices that each have their own corner crust. The buttery crust has a soft, fluffy bottom and middle with a very crisp edge. The sauce ranges from decent to good with a little more spice and flavor than the average chain and small chunks of tomato throughout. The cheese is very good, applied heavily with a very high pull away factor. The pepperoni is very juicy (and pretty oily), but almost always cooked beautifully as each little round begins to turn up on the edges and get slightly crisp. The prices are decent - comparable to the chains. If you must choose a delivery pizza place, this one gets my recommendation so far. Jet's is in Bellevue now, too. I like it! knead dough pizzeria in hendersonville.